Q : Can you tell us about yourself and your organizational affiliation? RR: Truah and Rabbis for Human Rights, North America are the same organization, as we changed our name in January this year. I am a conservative Rabbi and the Director of North-American programs. We also do work on issues in Israel and West bank but I do domestic work. Issues that are part of my portfolio are : Slavery, human trafficking, Labor trafficking and American Muslim community. Coalition of Amakelli in Florida (tomato industry), Anti-torture campaign: It has two campaigns – Americans against torture on war on terror and other on solitary confinement and we also do work with our partners. Their issues may not be directly correlated to ours, but we provide support. We are also involved in a big way in Immigration reforms. We had about 130 congregations taking part in the Human Rights (HR) Shabbat program, around international human rights day. The general consensus is that over 50% of Jews are associated with a synagogue and we work through Rabbis to articulate our messaging. Sometimes, Rabbis are able to speak out for justice in congregations and bring them with them, or at times bring their moral voices. While we focus domestically, and on Israel; we want to pick issues where we have some leverage, either as Americans or as Jews. For example, we did not get involved in Syria, though it is a major human rights question, simply because we don’t have leverage in that area. While it is good to raise awareness, we need to do something and pull people to do something. Awareness is a good place to start, but not to finish. Q: How do you set goals, gather support for your campaigns ? RR : Every year we do long and short term planning. Sometimes, it is about creating a resource to get it out there. I also work with partner organizations, and in some ways I am supporting needs which they articulate, That sense of campaign planning is all pervasive. During our campaign planning, we realized how much basic education about Islam is needed. Through some of our partners, we realized how critical that is, in our messaging too. When you compare the issue of Islamophobia with gay rights, the reason why the conversation about gay rights has changed in such a big way in the last two years is because people are aware of gay people. They have a friend or a family member who is gay. The reason Islam is demonized is because people don’t know Muslims. Even today, most Americans don’t know someone who is Muslim. Only 20-25% know who is a Muslim. It is much easier to believe stereotypes when there is no direct contact. Rabbis themselves have gotten to know the local imams, but they haven’t gotten together to get their communities together, yet. In part, because, it is hard to figure out how we talk about contentious issues such as Israel and Palestine. It does remain a challenge. On the other hand, there are successful models. The reason I mention Chicago, is that the community there is so well organized. The Jewish council on American Affairs have partnered on issues of shared concern – housing, immigration. The approach that they have taken is to focus on issues that are real and of concern to both communities. Q : What is the role of College campuses in addressing these issues? A : Because of the discussion surrounding Israel and Palestine, any dialogue is often politicized. On the other hand, there is also good Jewish-Muslim collaboration. On campuses, kids are from similar backgrounds, they are living together and are on similar wavelengths. When the AP reports of NYPD spying on Muslim college kids came out, some of the strongest pushback came from the Rabbis on campus. Such collaboration and support for each other gives me hope. I don’t want to say that we have to wait for another generation, as youth can be biased too, given the role that Jewish communities on campuses can play, and the expectations of parents that they will play such a key role in transmitting Jewish values. It is effective messaging when I tell parents that “How’d you like it if your child was afraid to go to Hillel, because he/she is being spied upon?” So, that’s interesting to me, and is something to watch. Q: How did you get involved with Truah? RR : I came to work with Truah during my senior year of Rabbinical school, that is about six years agoI came to work on the anti-torture campaign and it was really fascinating for me, as I thought of myself as a political junkie and also was involved in Jewish social justice wor. Torture brings up very deep issues and forces you to confront deep moral questions and for me, it was like beginning of an awakening of whose civil liberties are we willing to violate to feel safe. There is also the difference between feeling safe and being safe actually. That people for the perception of safety, are willing to victimize the other. The organization has changed much since I came, in all good ways. I feel the conversation in the Jewish community has changed and we are taking on more issues than before. Q : How big is your network and how do you carry out your campaigns? A : We are based in New York and have about 1800 Rabbis across the country. We have in the past had conferences but don’t currently do those anymore. IN the coming year, we are looking to do one day trainings, to educate Rabbis on skills building. Q : What is the state of inter-faith work ? What are the key challenges coming your way? RR : I think there is a lot going on and that is good. There are many organizations talking to each other. At shoulder to shoulder, we are all Abrahamic faiths. Through 1950s through 90’s, inter-faith meant Jewish and Christians and now it is becoming Jewish-Muslim-Christian and some sprinkling of other faith groups. When religions move to the US, they begin to organize like a church, and in other countries. New groups are developing their systems and they also don’t have clergy in the real sense. We started to bring Muslims in that structure, but there are challenges to go beyond Abrahamic faiths. The other challenge is of course when you are building a morality structure, around faith; there are those who are spiritual but not affiliated. This is a challenge too. How do we reach out to churches of color and immigrant communities? A lot is being done on the organizational level. A lot is going on, and I am not sure how much of it is entering the national conversation. I come from Canada, where religion is not as much as a public issue and national conversation, as it is here. It is an important fact about the U.S, compared to other countries and in particular Canada. Even if Americans are becoming less religious, religion is becoming a big part of the national dialogue. I wonder if the conversation about Muslims is not about religion per se but is more about immigration and so. 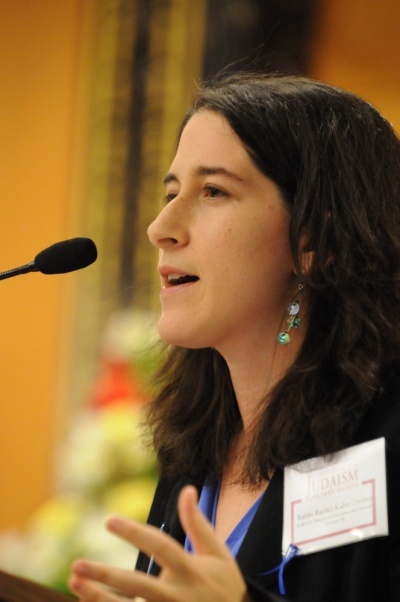 Q: Your experience with Jewish congregations? RR : What I see is that in times of tension whether the recent Muhammad film controversy, people who are liberal, fall into the stereotypes about Muslims. For example, they would say things like “ You never see Christians doing such things”, without an understanding of the dynamics. It is very easy for people to believe stereotypes of Muslims and Islam. Also, I believe it is refusal to take responsibility that they are believing in stereotypes. People are writing about the films and not having the background about it. For me, those are often challenges and even secular people can be so antagonistic. Q : How are you funded? RR: We are funded by both foundations and private donors. My sense is that there is money for this kind of work. There just seems to be more need for this. For many Jews the question is not whether they should support HR at all, because they are modern, ethical people and do from that standpoint. It is what is distinctly Jewish about supporting human rights. We are speaking to people who think about how to address these issues, from a Jewish perspective, rather than simply approaching them in a secular, neutral manner. One piece of push-back that I am getting and one that needs to be addressed both from Jewish and secular perspective is that of “Why should we care about HR when they (criminals or terrorists) don’t value them”? I try to tell them that it is not about their values, but our own. We don’t torture because it is against American values, it doesn’t matter what a terrorist will do in their cells, with their captives. We won’t let them set the agenda. It is troubling for me, and that is often where Jewish language comes in. What we do is what we do. We must uphold our values irrespective of how others behave with us. Q : What have you learnt that you’d like to share? RR : Inter-faith work is incredibly worth doing, and takes a long time and you have to be open to listening to the other. And also that you have to understand that inter-faith dialogue isn’t inter-faith agreement. And it is ok to engage with people who don’t agree with them and how can we expect them to agree with us, if we don’t agree with them. Reblogged this on MENASA World.